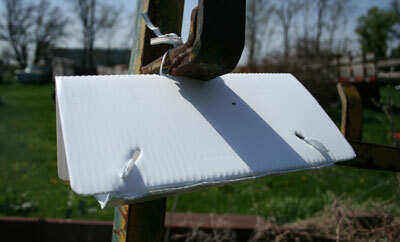 Trap Reports for variegated and black cutworms at 15 sites. Figure 2. 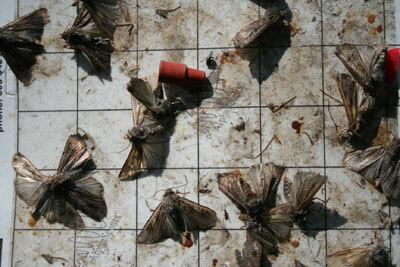 Male moths are attracted to pheromone lure (red, in center) and are caught on a sticky card in trap. Nebraska Extension educators have organized a pheromone trapping network to monitor black cutworm and variegated cutworm moth activity across Nebraska during the 2015 planting season. Traps started being placed into service the week of April 14. Traps are already being actively monitored in many locations, including Adams, Burt, Butler, Dixon, Hamilton, Johnson, Lancaster, Lincoln, Nemaha, Richardson, Saline, and Wayne Counties. Additional traps are expected to be placed into service very soon in Madison and Keith/Arthur counties. So far this year black cutworm moths have not been detected in Nebraska, but variegated cutworm activity has been documented from Adams County east to the Missouri River, and as far north as Burt County. Butler County has had the highest number of variegated cutworms, recording over 30 moths April 15-21. Variegated cutworm counts this week are lower than last week, in part due to colder night temperatures which limit moth flight activity. Moth activity does not necessarily correspond with later cutworm caterpillar outbreaks, but serves as an early warning that cutworms may be present. Weedy fields are most at risk as the vegetation is conducive for egg-laying by moths and provides food for the hatching caterpillars. Moth counts will be available on CropWatch beginning the week of April 27. For more information see Corn Cutworms (NebGuide G1153).